CrystalDiffract is a modern, 64-bit application with multi-touch control and advanced graphics tools. CrystalDiffract 6 for Mac and Windows represents an entirely new application, entirely rewritten for both platforms. CrystalDiffract for Mac is one of the very few genuine native scientific applications, written in Objective-C (Cocoa) with Apple's latest development tools. If you have a trackpad, you can use this to effortlessly scroll and zoom your diffraction patterns, as well as adjusting the Loupe size and magnification. CrystalDiffract 6 for OS X now provides undo/redo for menu commands, plus easy data sharing: just drag-and-drop patterns between windows. The application supports Full-Screen mode, including "Spaces". The Loupe provides a high-resolution view without needing to change the scale..
CrystalDiffract 6 features a sleek multi-pane window layout, including Patterns List, Graphics area, Reflexions List and Parameters controls. Search and find reflexions using the integrated search field: reflexions are highlighted on screen, and in the new Reflexions List. 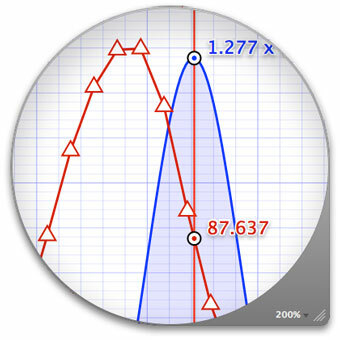 Double-click listed reflexions to show their peaks. CrystalDiffract 6 includes a slew of new tools to help your work: measuring positions, labelling peaks and magnifying graphics. The interactive ruler makes distance measurements quick and intuitive, but also lets you record intensities and peak widths. The Cursor tool provides real-time x-value, d-spacing and intensity measurements, with multi-pattern results shown in the Legend. The elegant Loupe lets you view high-resolution graphics without having to change the scale. 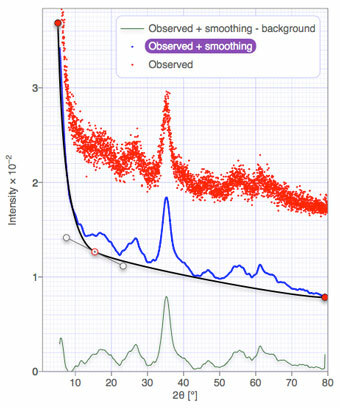 Peak tips identify reflexions in real time, and can be expanded to reveal diffraction data. The new Scattering Factors window, provides live visualization and editing, with beautiful graphics. High-resolution vector graphics (such as this image from the Scattering Factors window) can be copied or saved. CrystalDiffract 6 support the new "Retina" display, with beautiful, high-resolution graphics. You can now save the graphics from your diffraction window, or the Scattering Factor window: copy to the clipboard, or drag-and-drop into another program, or export to a text file. CrystalDiffract provides a choice of crisp, vector graphics that look great at any scale, or high-quality pixel graphics in a wide choice of formats (e.g., PNG, TIFF, JPEG) and sizes - some with transparency. The Parameters List offers full control over all aspects of your display including a wide choice of line and marker styles, labelling options, plus control over font sizes and styles. In "Film Mode" you can choose from a varied selection of colour schemes: Negative Positive, Fire, Ice and Rainbow. You can even simulate a film-like intensity response, to highlight weaker reflexions. 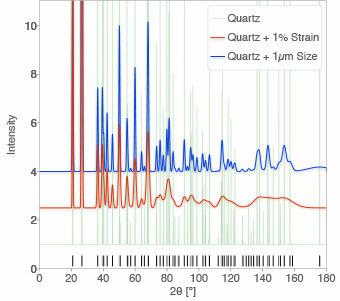 Simulating size/strain effects in Quartz. The new program lets you choose different ways to display a given simulation. So, for example, you might wish to plot your simulated time-of-flight neutron diffraction pattern as a function of d-spacing, or 1/d, rather than time-of-flight. You can now choose to plot any of your simulations as a function of "Q-space" (2π/d), in addition to the other x-axis choices. Following popular demand, we have added a "Logarithmic Intensity" mode, to make it easier to find weaker reflexions in the presence of stronger ones. CrystalDiffract can now simulate the effects of non-random distributions of platy or needle-shaped crystals. Reflexions are now grouped by symmetry, rather than just d-spacing, making it easier for you to compare patterns as a function of temperature or pressure, as relative peak positions change. The effects of atomic displacement parameters (thermal ellipsoids) can now be previewed in real time, using site-specific controls in the Parameters List. A wider d-spacing range is now used for default calculations, resulting in less chance of high-angle reflexions being omitted. Other changes include electron powder diffraction, and the ability to export diffraction profiles for observed patterns (e.g., after background subtraction) and for simulated mixtures. 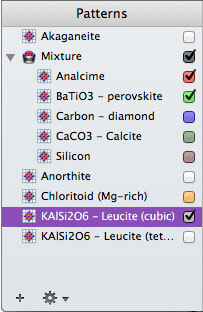 Multi-phase mixtures appear are shown as containers in the Patterns List: just drag-and-drop any kind of pattern into, or out of the Mixture group. CrystalDiffract lets you create mixture groups in the Patterns List: folder-like container into which you can drag-and-drop patterns - with the simulation being automatically updated. You can even combine observed and simulated patterns in the same mixture. You are no longer limited to a single mixture "mode". Instead, each window can contain multiple mixtures as well as separate patterns. You can even display the individual components of a mixture, together with the simulated mixture total.. 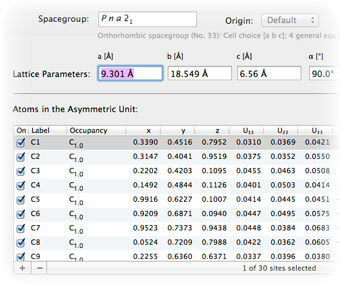 The Parameters List makes it easier than ever to customize the composition of your simulated mixture. The new Mixture group provides dedicated slider and text controls for each mixture component, with the ability to lock the phase total, or enter individual values without upsetting the other components. Using the crystal editor to create a new structure for simulating diffraction. CrystalDiffract now includes its own, highly-robust CIF parser, allowing you to simulate diffraction patterns simply by dragging-and-dropping CIF files into the program. The program also supports STRUPLO and CrystalMaker Text (CMTX) file formats - in addition to CrystalMaker binary "crystal" files. You can now create crystal structures directly within the program, and edit all aspects of their structures, including symmetry, cell parameters, atomic coordinates and thermal ellipsoids. Observed diffraction patterns can be edited within the program, using a dedicated editor. You can also create new patterns within the program - no longer reliant on using a text editor. Some of the file types supported by CrystalDiffract 6. CrystalDiffract now supports data import from Rigaku-Scintag "ASC" diffractometer files (in addition to standard "XY" data files). CrystalDiffract imports and exports crystal structure data to and from CIF and CMTX text files (also imports STRUPLO crystal files). 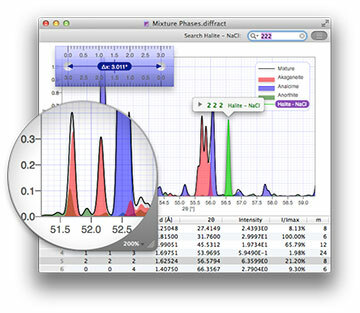 Diffraction profiles can be exported - including edited observed patterns. 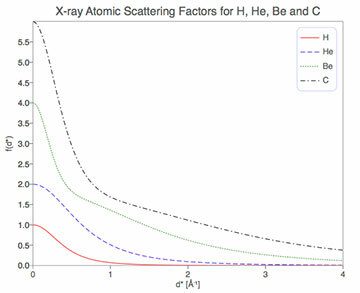 Simulated diffraction data can be exported, as sorted reflexions lists and tables of Structure Factors. Want to check the validity of a structure whose diffraction you've just simulated? Simply select the pattern and choose the "Visualize Crystal Structure" command. The crystal structure is automatically loaded into CrystalMaker (if installed) and displayed on screen: a seamless exchange that maximizes your productivity and provides an essential visual check when dealing with imported crystallographic data. Working with CrystalMaker 10.4 or later, you can enable "Live Diffraction Mode" from CrystalMaker so that as you edit your structure in that program, you can instantly see its corresponding powder diffraction pattern update in CrystalDiffract! For example, click-and-drag and atom in your crystal, and watch how the powder peaks change; even better, animate a sequence of structures through a phase transition and watch the diffration change in real time! Noisy data (top), smoothed (middle) with background subtracted (bottom). Other programs rely on cumbersome techniques to subtract the background: either complex parameterization or requiring users to attempt to find areas of the pattern that are free from any peaks, and then attempting a polynomial curve fit. CrystalDiffract takes a much more intuitive approach: you simply define your background function by clicking-and-dragging control points. The software uses sophisticated Bézier-curves to create a smooth profile that's ideal for complex backgrounds which may have many independent contributions, and for which parameterization may fail. Noisy data can be hard to analyze, so CrystalDiffract now provides fast bilinear smoothing, with real-time slider control. Observed diffraction patterns can be scaled, both in terms of their intensities, but also in terms of their x-values. This is useful for converting units, e.g., from microseconds to milliseconds for time-of-flight diffraction.